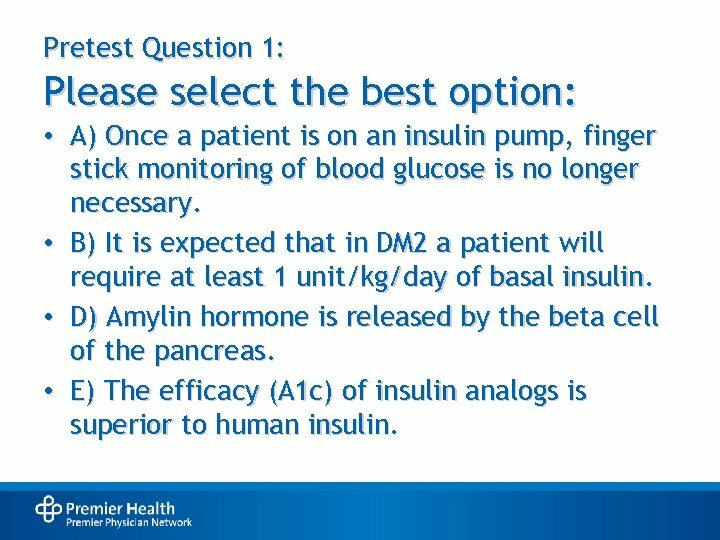 Pretest Question 1: Please select the best option: • A) Once a patient is on an insulin pump, finger stick monitoring of blood glucose is no longer necessary. 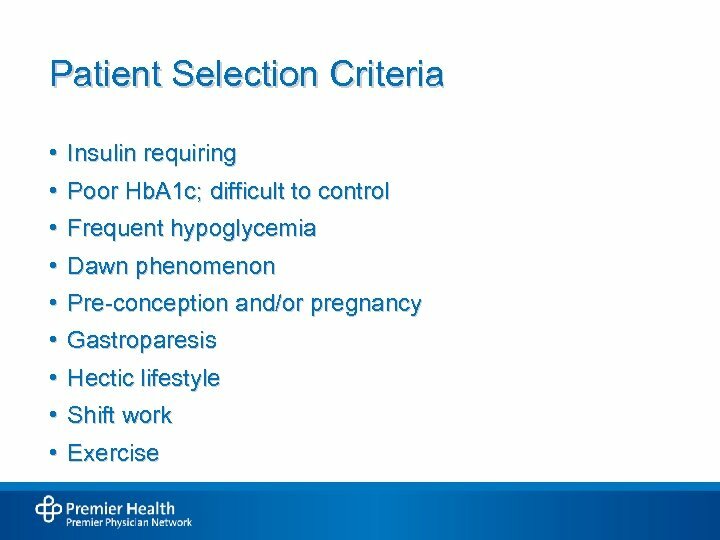 • B) It is expected that in DM 2 a patient will require at least 1 unit/kg/day of basal insulin. 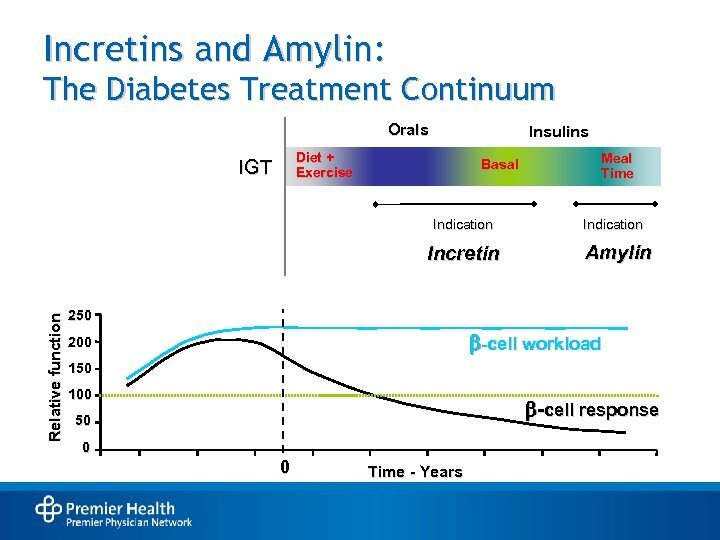 • D) Amylin hormone is released by the beta cell of the pancreas. 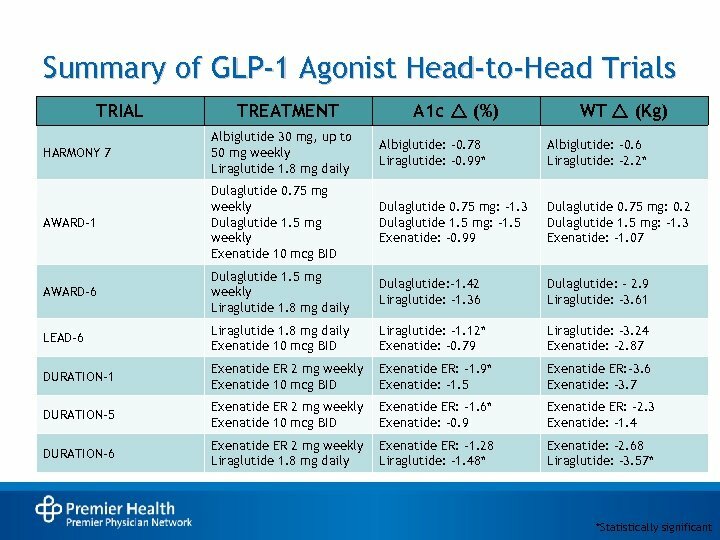 • E) The efficacy (A 1 c) of insulin analogs is superior to human insulin. 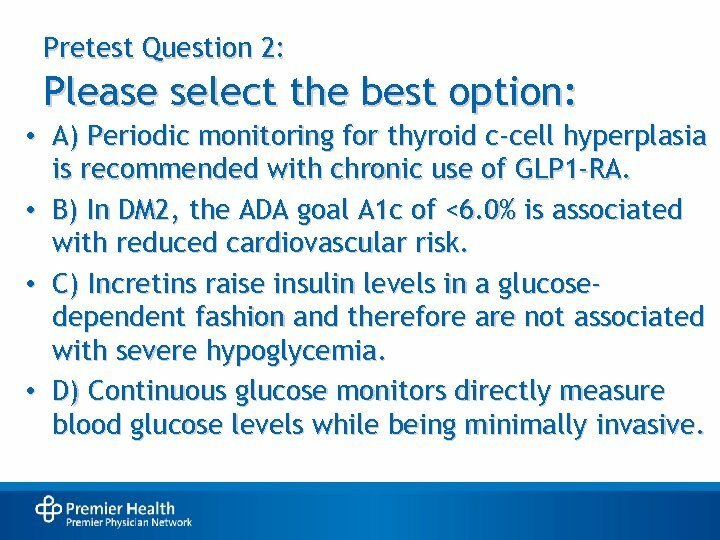 Pretest Question 2: Please select the best option: • A) Periodic monitoring for thyroid c-cell hyperplasia is recommended with chronic use of GLP 1 -RA. 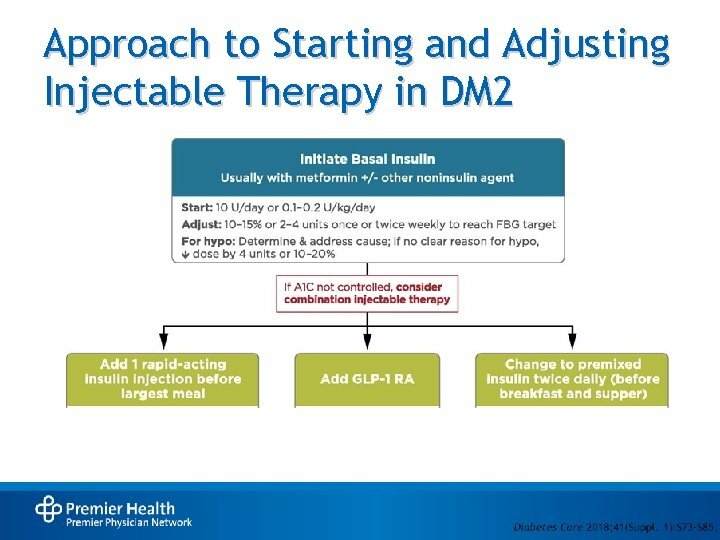 • B) In DM 2, the ADA goal A 1 c of <6. 0% is associated with reduced cardiovascular risk. 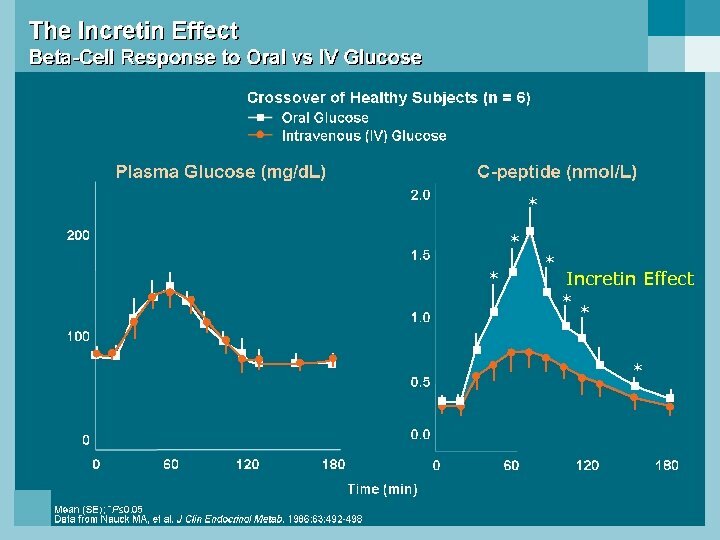 • C) Incretins raise insulin levels in a glucosedependent fashion and therefore are not associated with severe hypoglycemia. 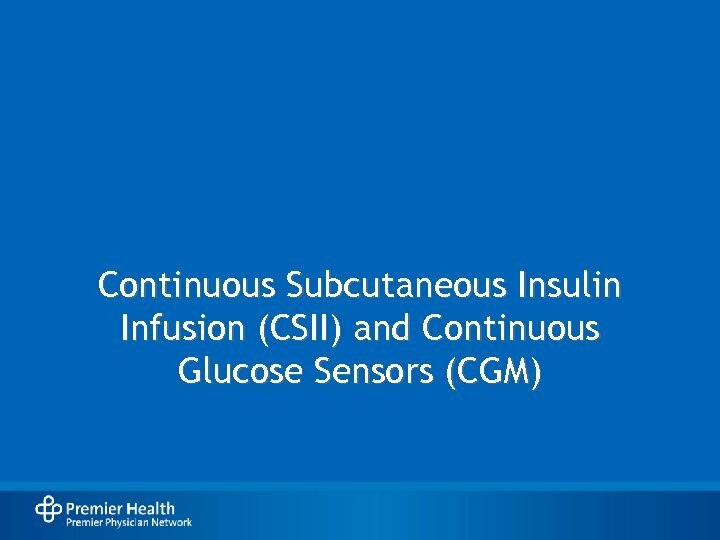 • D) Continuous glucose monitors directly measure blood glucose levels while being minimally invasive. 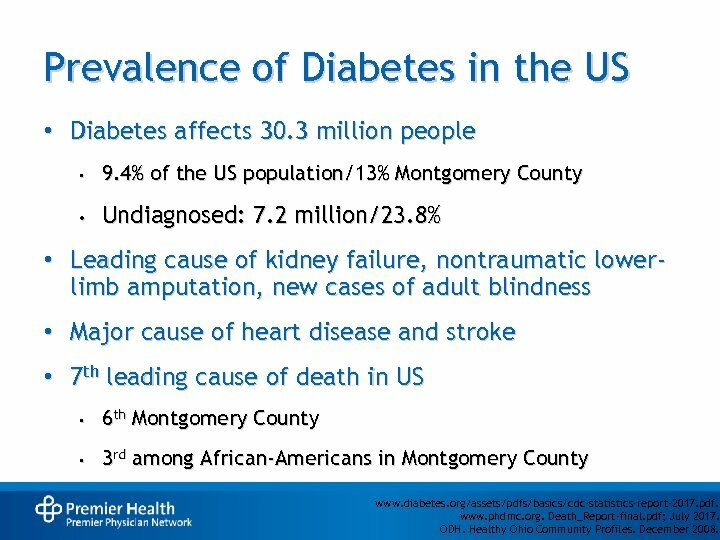 Prevalence of Diabetes in the US • Diabetes affects 30. 3 million people • 9. 4% of the US population/13% Montgomery County • Undiagnosed: 7. 2 million/23. 8% • Leading cause of kidney failure, nontraumatic lowerlimb amputation, new cases of adult blindness • Major cause of heart disease and stroke • 7 th leading cause of death in US • 6 th Montgomery County • 3 rd among African-Americans in Montgomery County www. diabetes. org/assets/pdfs/basics/cdc-statistics-report-2017. pdf. www. phdmc. org. Death_Report-final. pdf; July 2017. ODH. Healthy Ohio Community Profiles. December 2008. 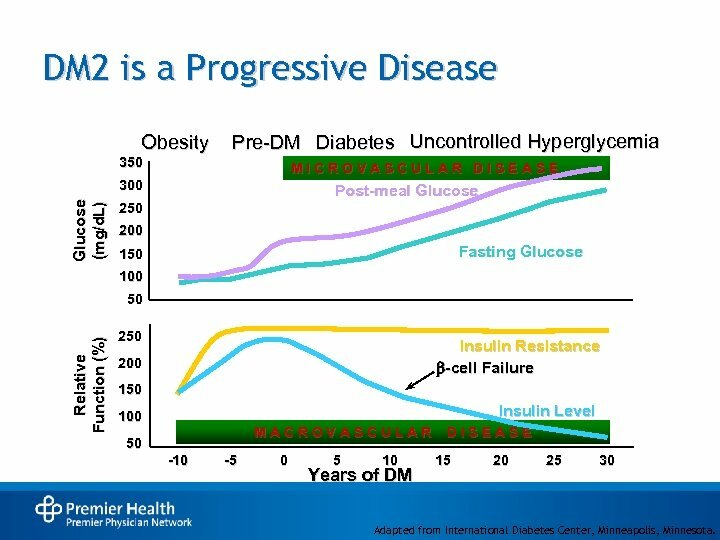 DM 2 is a Progressive Disease Obesity Pre-DM Diabetes Uncontrolled Hyperglycemia 350 MICROVASCULAR DISEASE Glucose (mg/d. 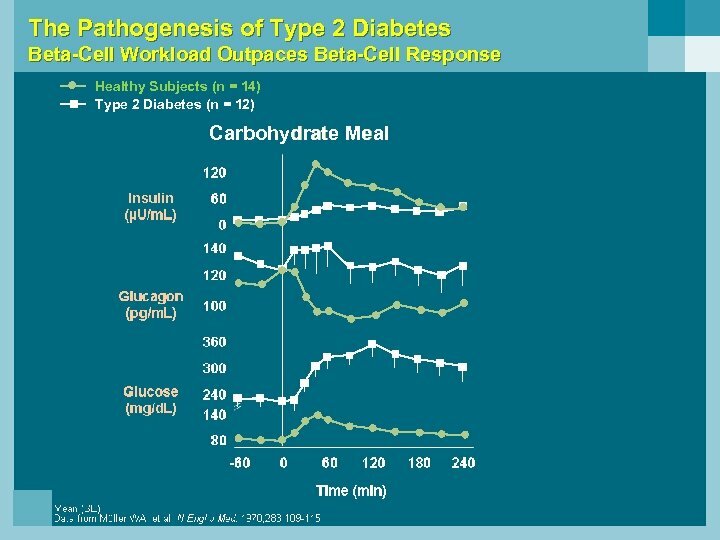 L) 300 Post-meal Glucose 250 200 Fasting Glucose 150 100 Relative Function (%) 50 250 Insulin Resistance -cell Failure 200 150 Insulin Level 100 MACROVASCULAR 50 -10 -5 0 5 10 Years of DM DISEASE 15 20 25 30 Adapted from International Diabetes Center, Minneapolis, Minnesota. 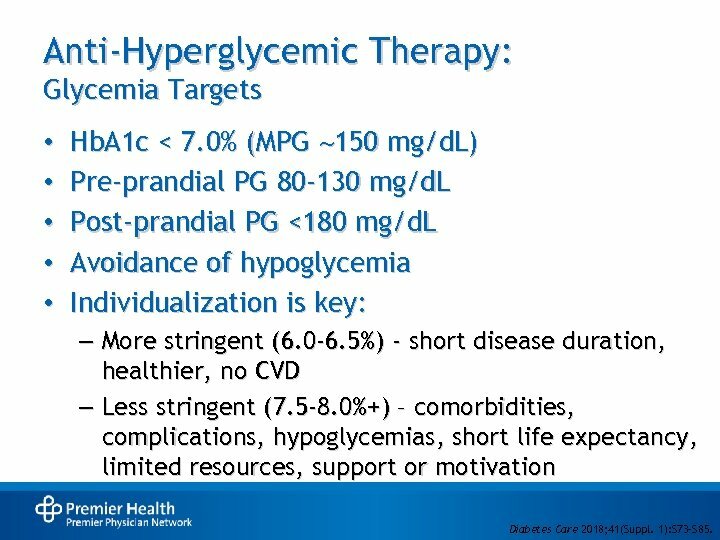 Anti-Hyperglycemic Therapy: Glycemia Targets • • • Hb. A 1 c < 7. 0% (MPG 150 mg/d. 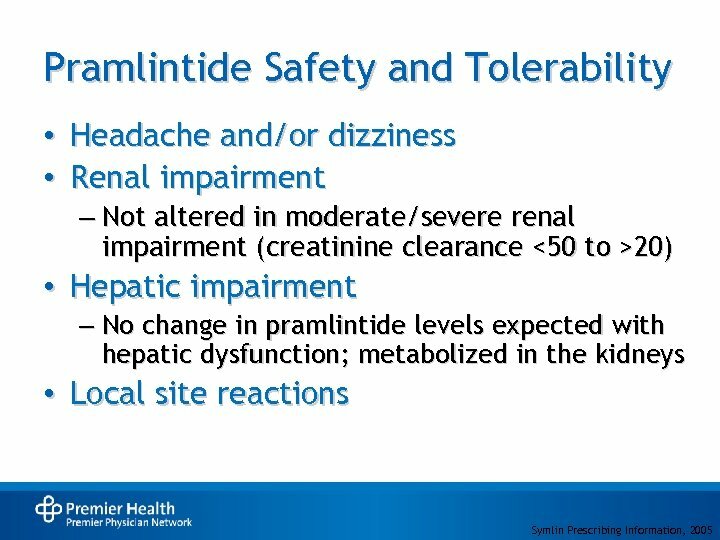 L) Pre-prandial PG 80 -130 mg/d. 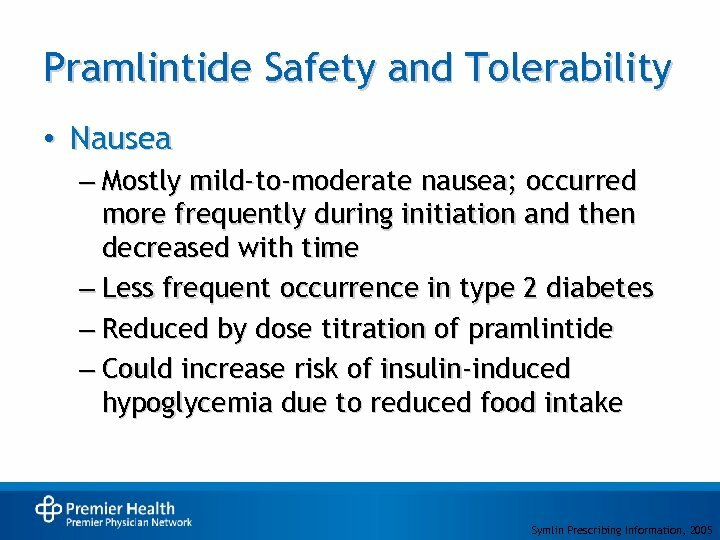 L Post-prandial PG <180 mg/d. 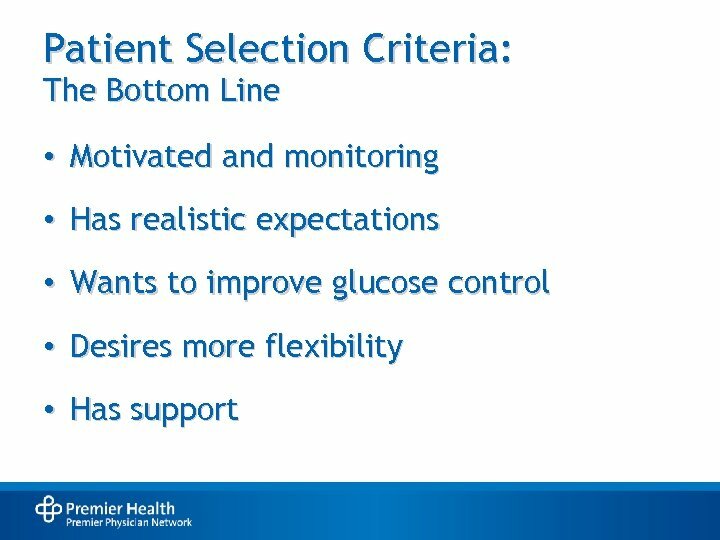 L Avoidance of hypoglycemia Individualization is key: – More stringent (6. 0 -6. 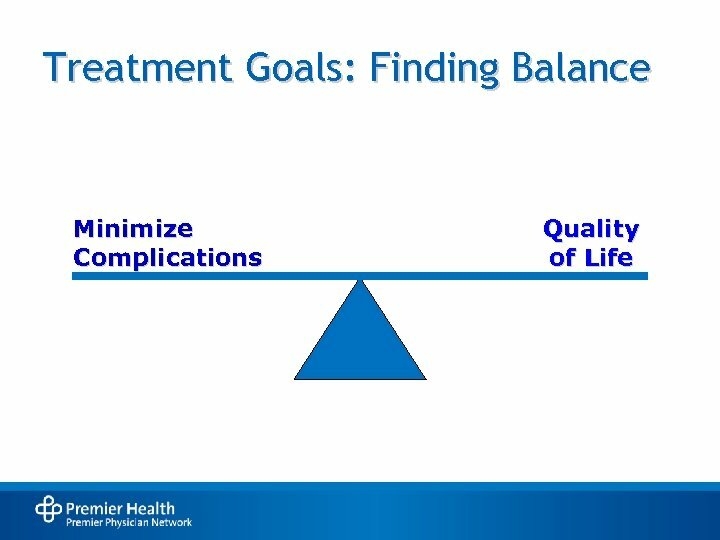 5%) - short disease duration, healthier, no CVD – Less stringent (7. 5 -8. 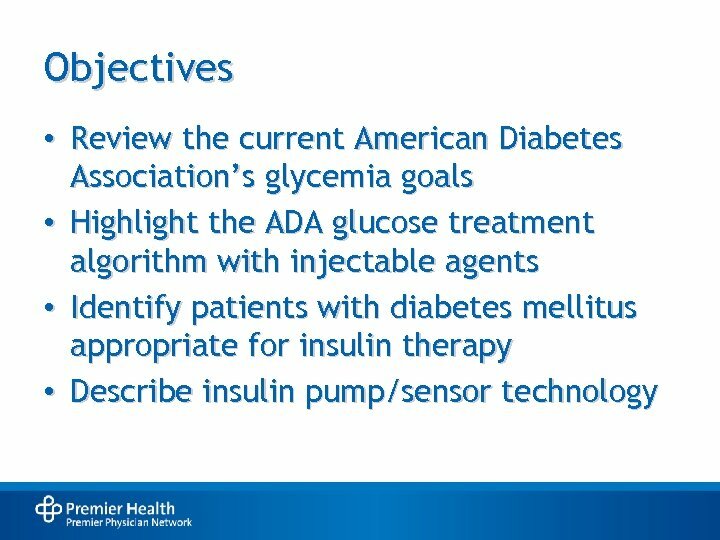 0%+) – comorbidities, complications, hypoglycemias, short life expectancy, limited resources, support or motivation • Diabetes Care 2018; 41(Suppl. 1): S 73–S 85. 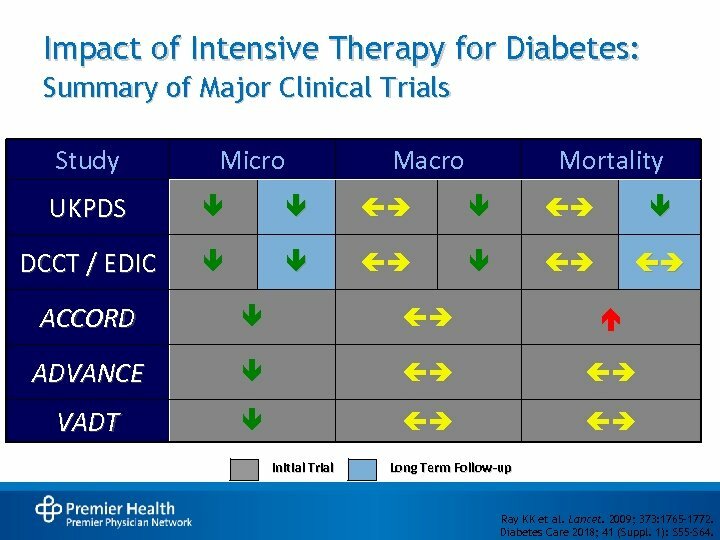 Impact of Intensive Therapy for Diabetes: Summary of Major Clinical Trials Study Micro Macro Mortality UKPDS DCCT / EDIC ACCORD ADVANCE VADT Initial Trial Long Term Follow-up Ray KK et al. Lancet. 2009; 373: 1765– 1772. Diabetes Care 2018; 41 (Suppl. 1): S 55 -S 64. 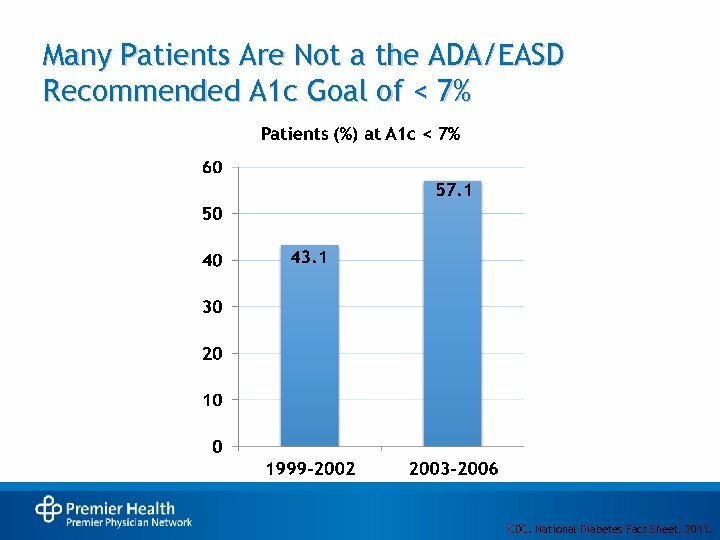 Many Patients Are Not a the ADA/EASD Recommended A 1 c Goal of < 7% CDC. National Diabetes Fact Sheet. 2011. 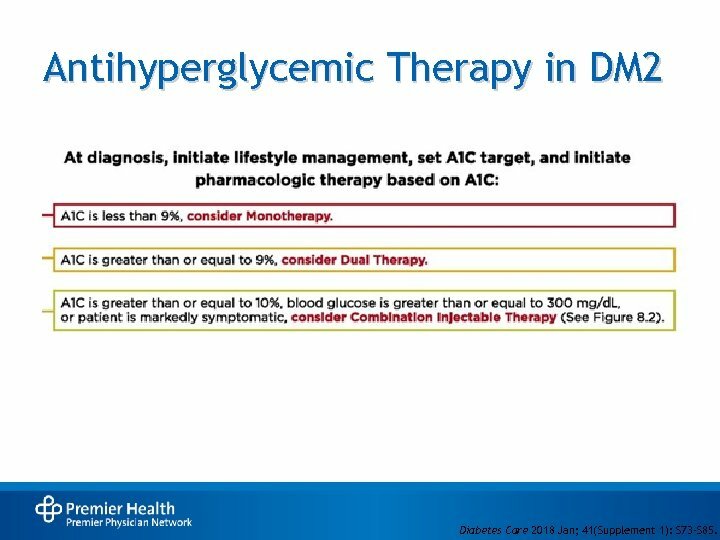 Antihyperglycemic Therapy in DM 2 Diabetes Care 2018 Jan; 41(Supplement 1): S 73 -S 85. 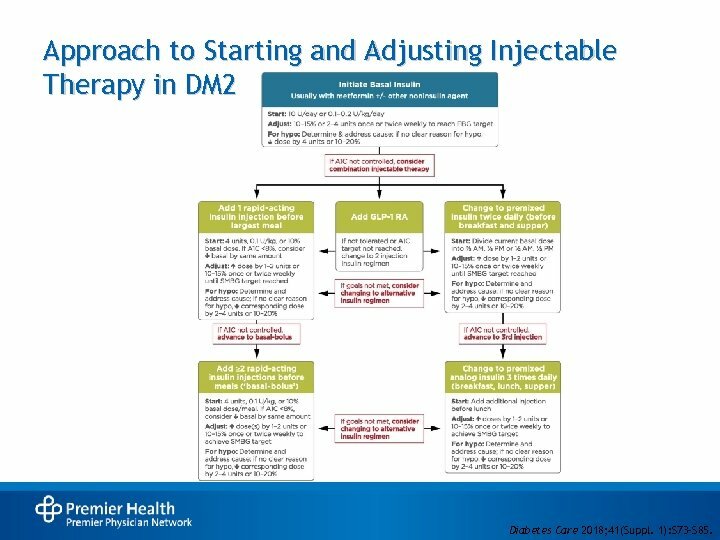 Approach to Starting and Adjusting Injectable Therapy in DM 2 • Diabetes Care 2018; 41(Suppl. 1): S 73–S 85. 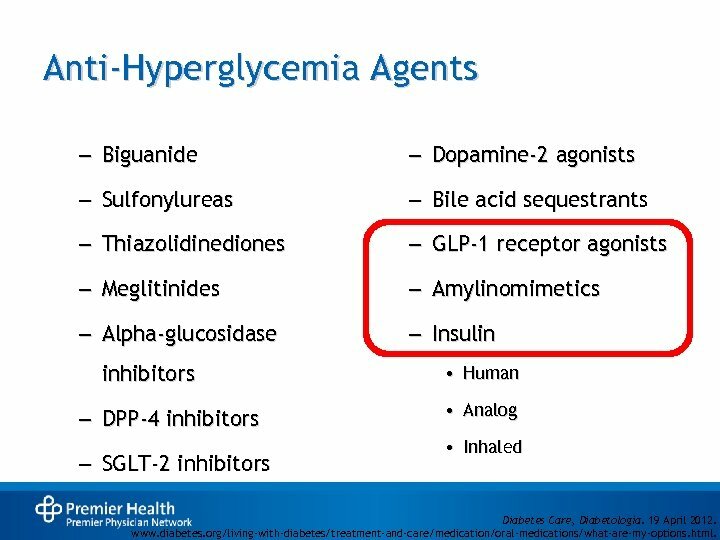 Anti-Hyperglycemia Agents – Biguanide – Dopamine-2 agonists – Sulfonylureas – Bile acid sequestrants – Thiazolidinediones – GLP-1 receptor agonists – Meglitinides – Amylinomimetics – Alpha-glucosidase – Insulin inhibitors – DPP-4 inhibitors – SGLT-2 inhibitors • Human • Analog • Inhaled Diabetes Care, Diabetologia. 19 April 2012. www. diabetes. 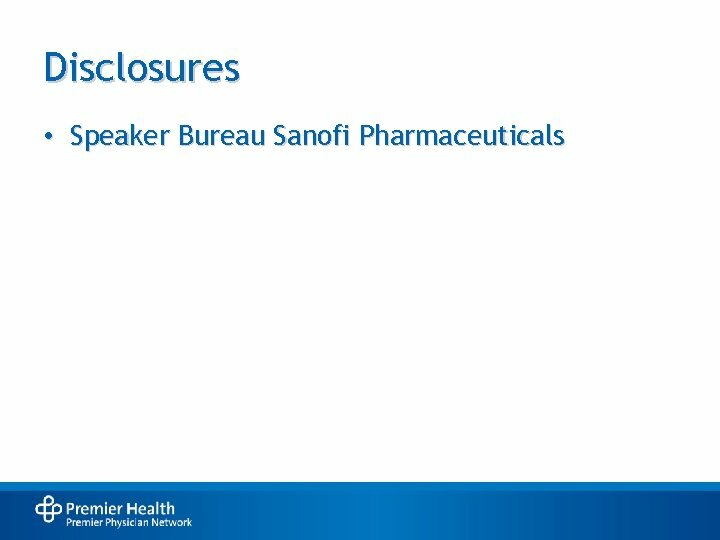 org/living-with-diabetes/treatment-and-care/medication/oral-medications/what-are-my-options. html. 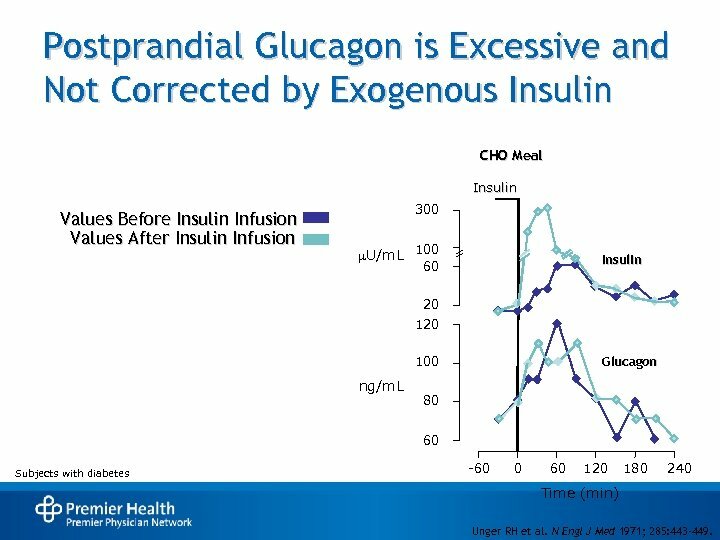 Postprandial Glucagon is Excessive and Not Corrected by Exogenous Insulin CHO Meal Insulin Values Before Insulin Infusion Values After Insulin Infusion 300 U/m. 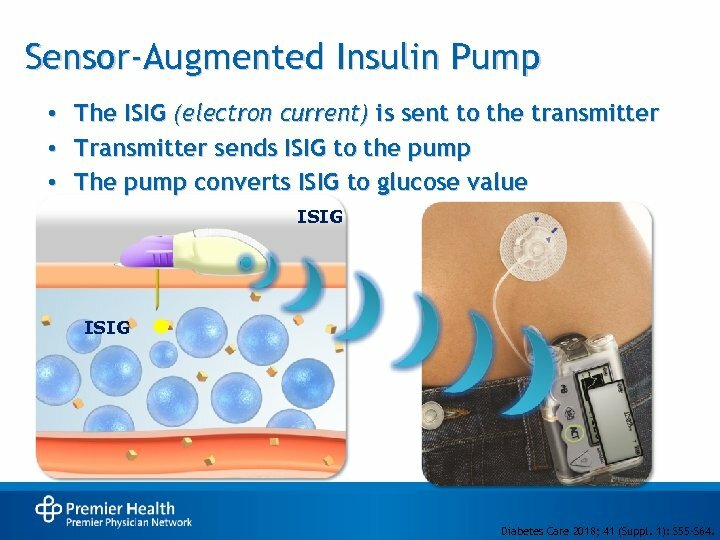 L 100 Insulin 60 20 100 ng/m. 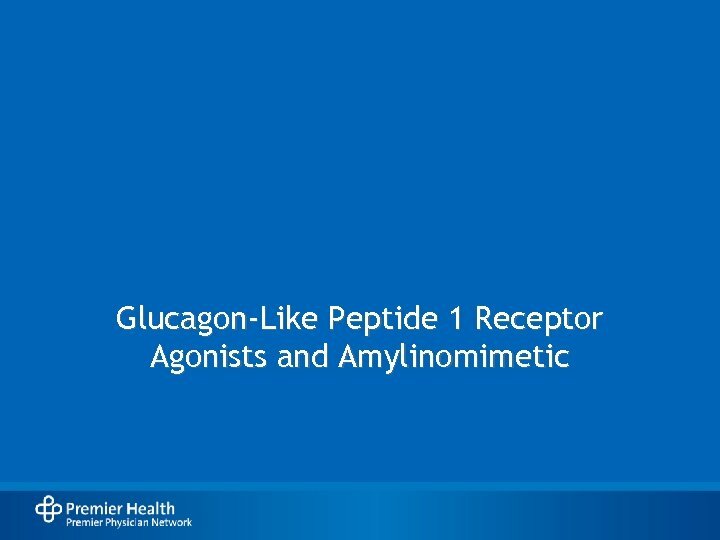 L Glucagon 80 60 Subjects with diabetes -60 0 60 120 180 240 Time (min) Unger RH et al. N Engl J Med 1971; 285: 443 -449. 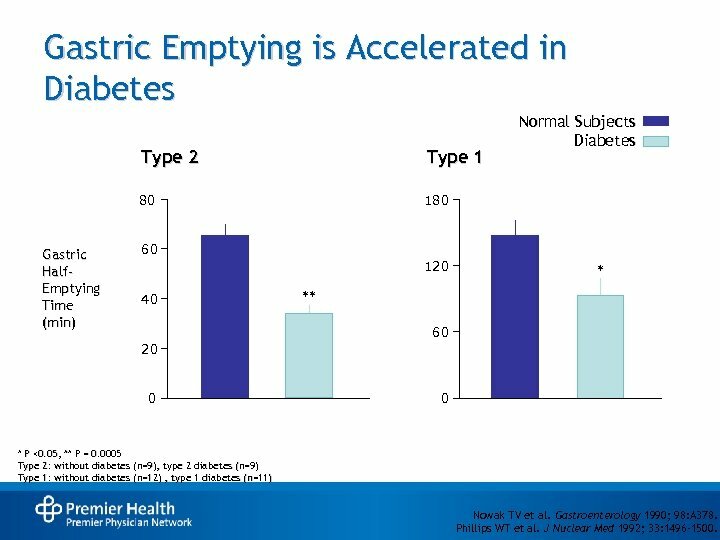 Gastric Emptying is Accelerated in Diabetes Type 2 80 Gastric Half. Emptying Time (min) Type 1 Normal Subjects Diabetes 180 60 120 40 * ** 60 20 0 0 * P <0. 05, ** P = 0. 0005 Type 2: without diabetes (n=9), type 2 diabetes (n=9) Type 1: without diabetes (n=12) , type 1 diabetes (n=11) Nowak TV et al. Gastroenterology 1990; 98: A 378. Phillips WT et al. J Nuclear Med 1992; 33: 1496 -1500. 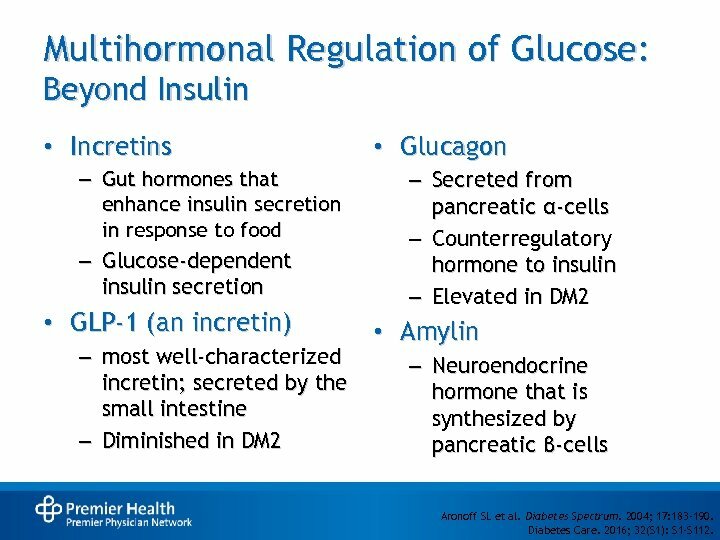 Multihormonal Regulation of Glucose: Beyond Insulin • Incretins – Gut hormones that enhance insulin secretion in response to food – Glucose-dependent insulin secretion • GLP-1 (an incretin) – most well-characterized incretin; secreted by the small intestine – Diminished in DM 2 • Glucagon – Secreted from pancreatic α-cells – Counterregulatory hormone to insulin – Elevated in DM 2 • Amylin – Neuroendocrine hormone that is synthesized by pancreatic β-cells Aronoff SL et al. 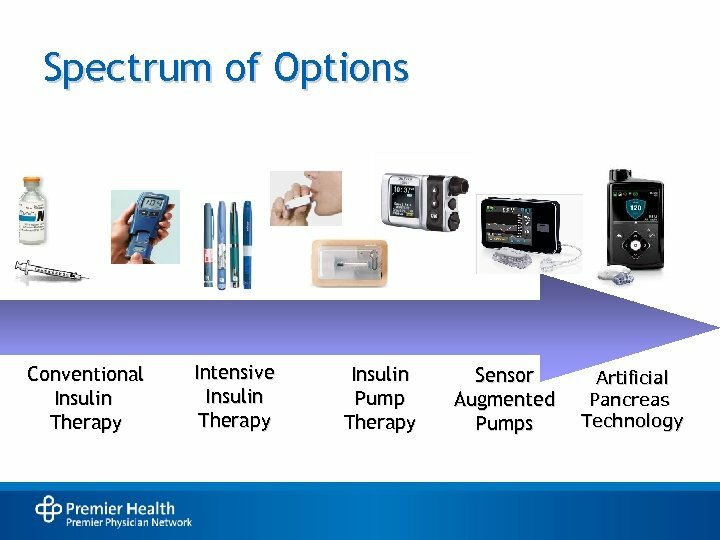 Diabetes Spectrum. 2004; 17: 183 -190. Diabetes Care. 2016; 32(S 1): S 1 -S 112. 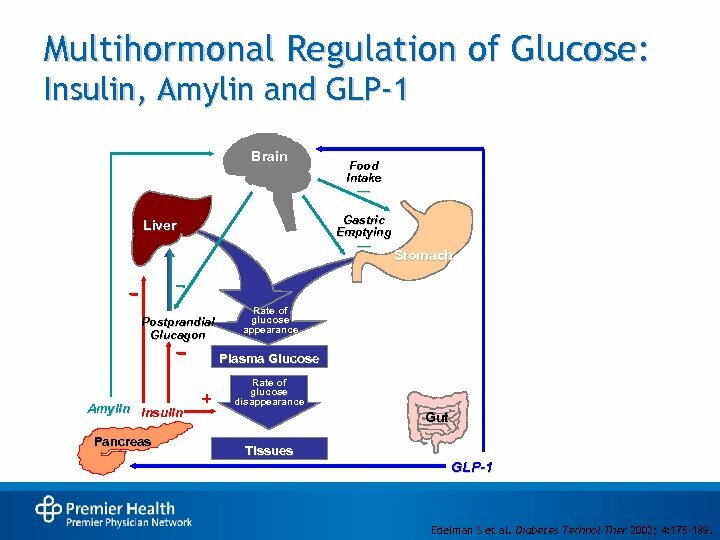 Multihormonal Regulation of Glucose: Insulin, Amylin and GLP-1 Brain Food Intake — Gastric Emptying Liver — Postprandial Glucagon Stomach Rate of glucose appearance Plasma Glucose Amylin Insulin Pancreas Rate of glucose disappearance Gut Tissues GLP-1 Edelman S et al. Diabetes Technol Ther 2002; 4: 175 -189. 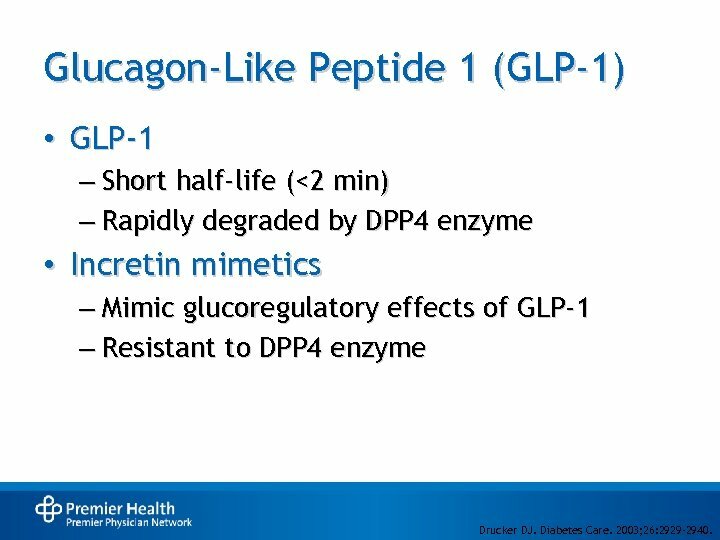 Glucagon-Like Peptide 1 (GLP-1) • GLP-1 – Short half-life (<2 min) – Rapidly degraded by DPP 4 enzyme • Incretin mimetics – Mimic glucoregulatory effects of GLP-1 – Resistant to DPP 4 enzyme Drucker DJ. Diabetes Care. 2003; 26: 2929 -2940. 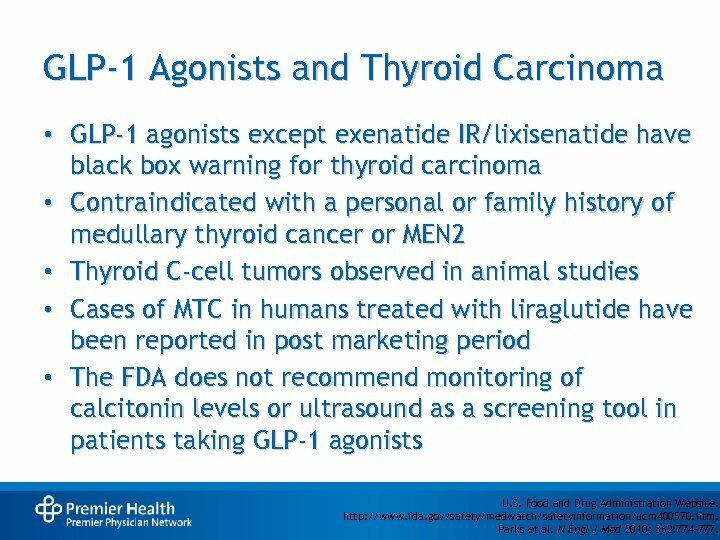 GLP-1 Agonists and Thyroid Carcinoma • GLP-1 agonists except exenatide IR/lixisenatide have black box warning for thyroid carcinoma • Contraindicated with a personal or family history of medullary thyroid cancer or MEN 2 • Thyroid C-cell tumors observed in animal studies • Cases of MTC in humans treated with liraglutide have been reported in post marketing period • The FDA does not recommend monitoring of calcitonin levels or ultrasound as a screening tool in patients taking GLP-1 agonists U. S. Food and Drug Administration Website. http: //www. fda. gov/safety/medwatch/safetyinformation/ucm 400570. htm. Parks et al. N Engl J Med 2010; 362: 774– 777. 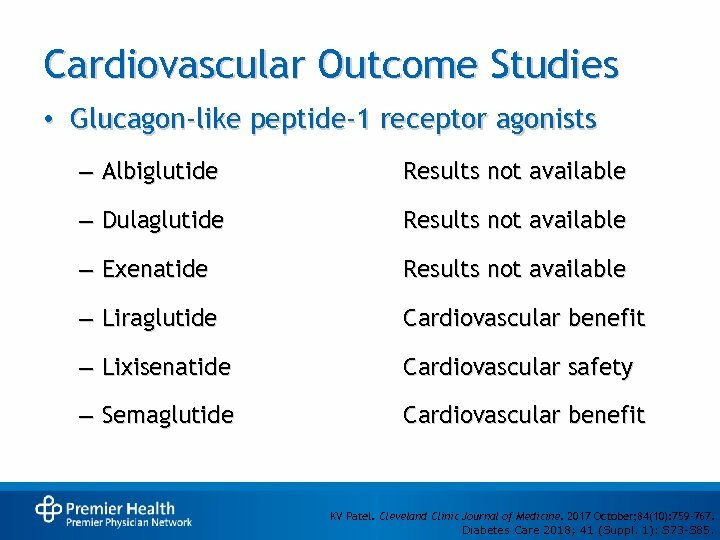 Cardiovascular Outcome Studies • Glucagon-like peptide-1 receptor agonists – Albiglutide Results not available – Dulaglutide Results not available – Exenatide Results not available – Liraglutide Cardiovascular benefit – Lixisenatide Cardiovascular safety – Semaglutide Cardiovascular benefit KV Patel. Cleveland Clinic Journal of Medicine. 2017 October; 84(10): 759 -767. Diabetes Care 2018; 41 (Suppl. 1): S 73 -S 85. 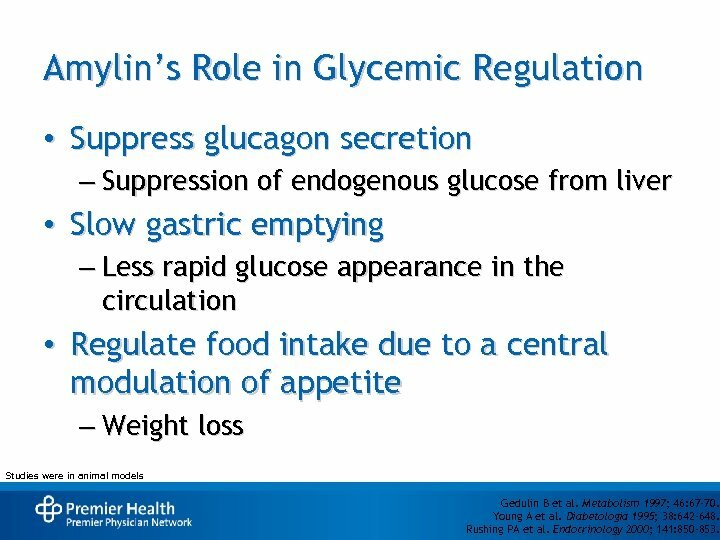 Amylin’s Role in Glycemic Regulation • Suppress glucagon secretion – Suppression of endogenous glucose from liver • Slow gastric emptying – Less rapid glucose appearance in the circulation • Regulate food intake due to a central modulation of appetite – Weight loss Studies were in animal models Gedulin B et al. Metabolism 1997; 46: 67 -70. Young A et al. Diabetologia 1995; 38: 642 -648. Rushing PA et al. Endocrinology 2000; 141: 850 -853. 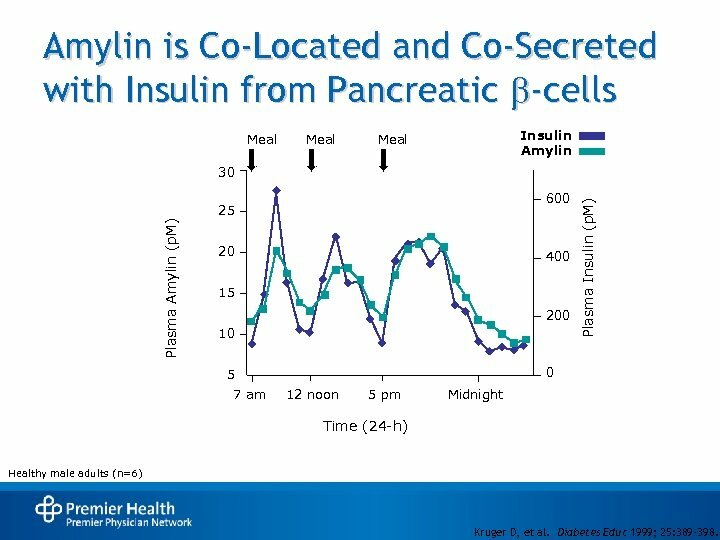 Amylin is Co-Located and Co-Secreted with Insulin from Pancreatic b-cells Meal Insulin Amylin Meal 600 Plasma Amylin (p. M) 25 20 400 15 200 10 0 5 7 am Plasma Insulin (p. M) 30 12 noon 5 pm Midnight Time (24 -h) Healthy male adults (n=6) Kruger D, et al. Diabetes Educ 1999; 25: 389 -398. 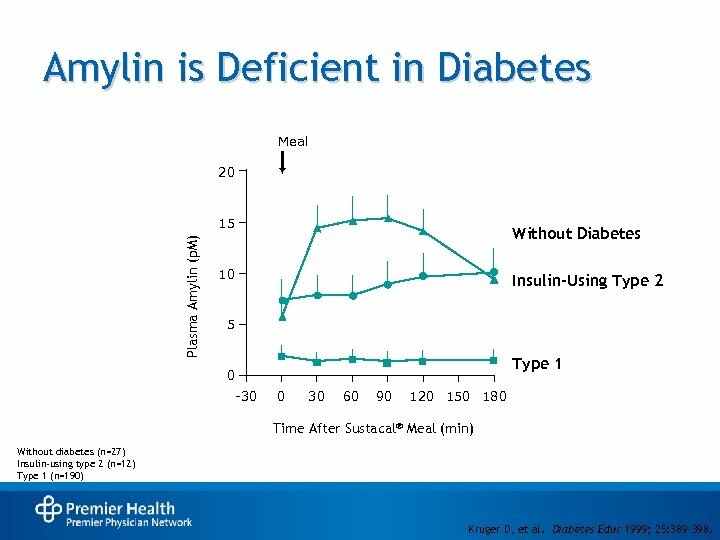 Amylin is Deficient in Diabetes Meal 20 Plasma Amylin (p. M) 15 Without Diabetes 10 Insulin-Using Type 2 5 Type 1 0 -30 0 30 60 90 120 150 180 Time After Sustacal® Meal (min) Without diabetes (n=27) Insulin-using type 2 (n=12) Type 1 (n=190) Kruger D, et al. Diabetes Educ 1999; 25: 389 -398. 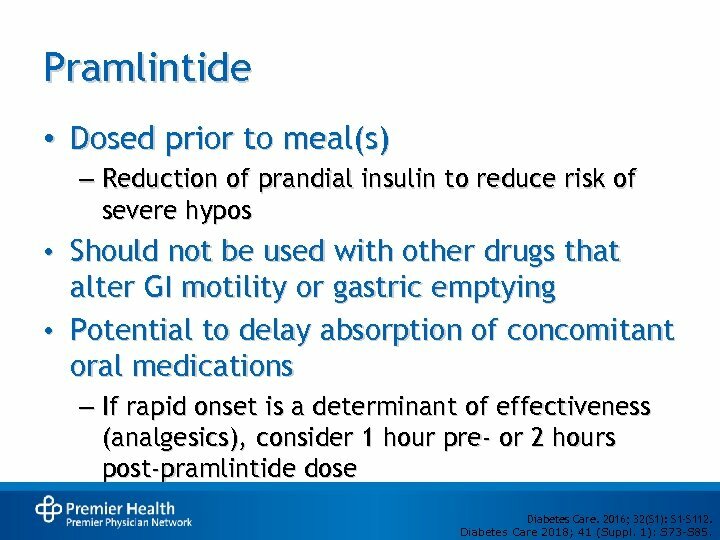 Pramlintide • Dosed prior to meal(s) – Reduction of prandial insulin to reduce risk of severe hypos • Should not be used with other drugs that alter GI motility or gastric emptying • Potential to delay absorption of concomitant oral medications – If rapid onset is a determinant of effectiveness (analgesics), consider 1 hour pre- or 2 hours post-pramlintide dose Diabetes Care. 2016; 32(S 1): S 1 -S 112. Diabetes Care 2018; 41 (Suppl. 1): S 73 -S 85. 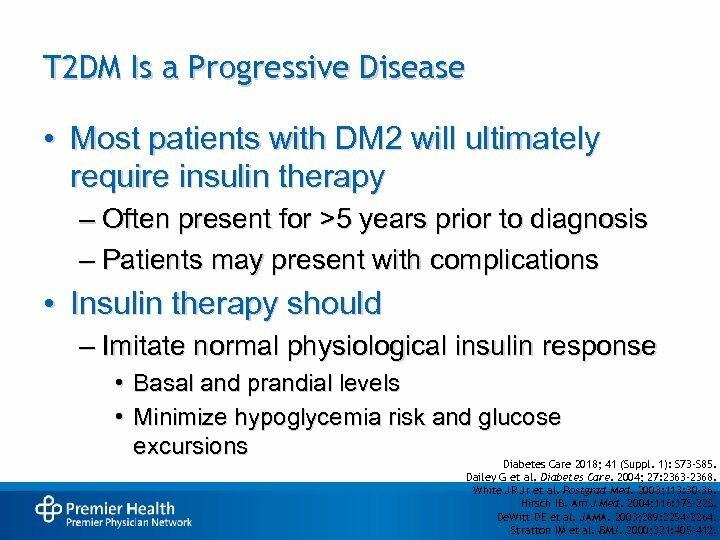 T 2 DM Is a Progressive Disease • Most patients with DM 2 will ultimately require insulin therapy – Often present for >5 years prior to diagnosis – Patients may present with complications • Insulin therapy should – Imitate normal physiological insulin response • Basal and prandial levels • Minimize hypoglycemia risk and glucose excursions Diabetes Care 2018; 41 (Suppl. 1): S 73 -S 85. Dailey G et al. Diabetes Care. 2004; 27: 2363 -2368. White JR Jr et al. Postgrad Med. 2003; 113: 30 -36. Hirsch IB. Am J Med. 2004; 116: 17 S-22 S. De. Witt DE et al. JAMA. 2003; 289: 2254 -2264. Stratton IM et al. BMJ. 2000; 321: 405 -412. 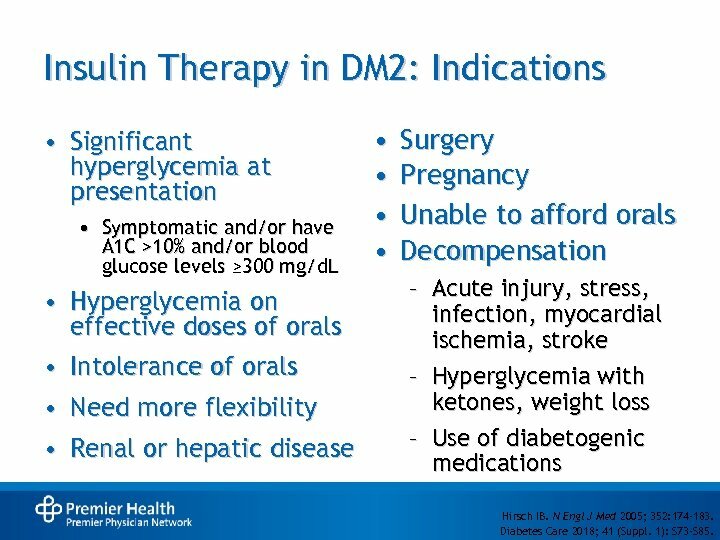 Insulin Therapy in DM 2: Indications • Significant hyperglycemia at presentation • Symptomatic and/or have A 1 C >10% and/or blood glucose levels ≥ 300 mg/d. 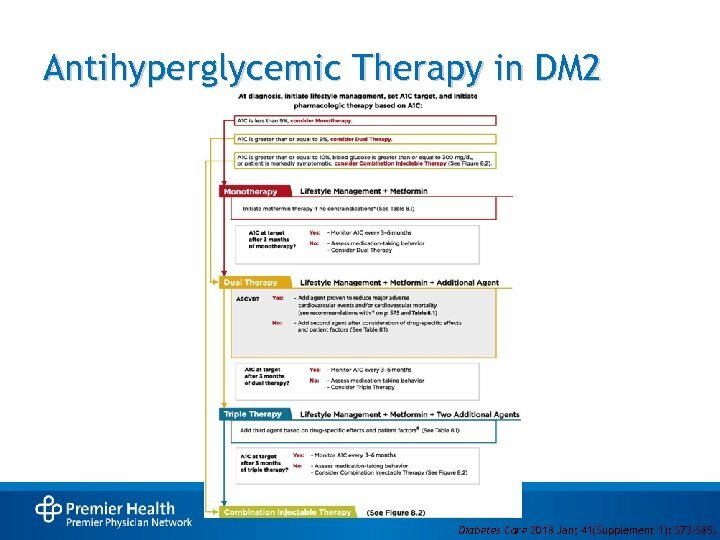 L • Hyperglycemia on effective doses of orals • Intolerance of orals • Need more flexibility • Renal or hepatic disease • • Surgery Pregnancy Unable to afford orals Decompensation – Acute injury, stress, infection, myocardial ischemia, stroke – Hyperglycemia with ketones, weight loss – Use of diabetogenic medications Hirsch IB. N Engl J Med 2005; 352: 174 -183. Diabetes Care 2018; 41 (Suppl. 1): S 73 -S 85. 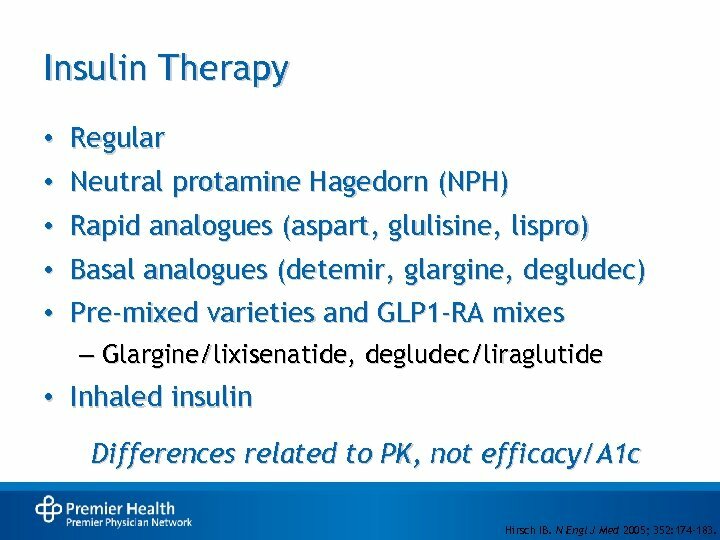 Insulin Therapy • • Regular Neutral protamine Hagedorn (NPH) • Rapid analogues (aspart, glulisine, lispro) • Basal analogues (detemir, glargine, degludec) • Pre-mixed varieties and GLP 1 -RA mixes – Glargine/lixisenatide, degludec/liraglutide • Inhaled insulin Differences related to PK, not efficacy/A 1 c Hirsch IB. N Engl J Med 2005; 352: 174 -183. 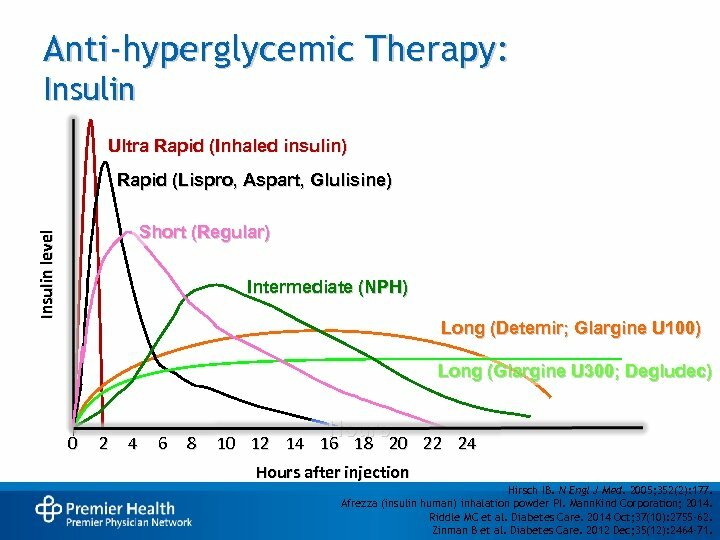 Anti-hyperglycemic Therapy: Insulin Ultra Rapid (Inhaled insulin) Rapid (Lispro, Aspart, Glulisine) Insulin level Short (Regular) Intermediate (NPH) Long (Detemir; Glargine U 100) Long (Glargine U 300; Degludec) 0 2 4 6 8 Hours 10 12 14 16 18 20 22 24 Hours after injection Hirsch IB. N Engl J Med. 2005; 352(2): 177. Afrezza (insulin human) inhalation powder PI. Mann. Kind Corporation; 2014. Riddle MC et al. Diabetes Care. 2014 Oct; 37(10): 2755 -62. Zinman B et al. Diabetes Care. 2012 Dec; 35(12): 2464 -71. 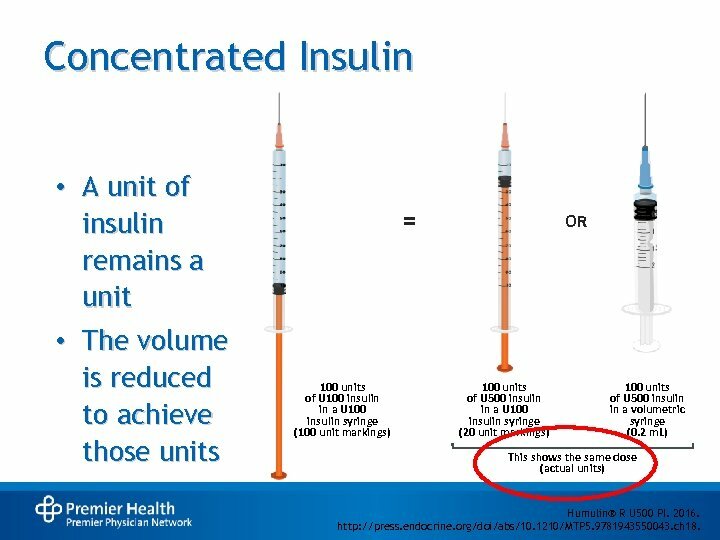 Concentrated Insulin • A unit of insulin remains a unit • The volume is reduced to achieve those units = 100 units of U 100 insulin in a U 100 insulin syringe (100 unit markings) OR 100 units of U 500 insulin in a U 100 insulin syringe (20 unit markings) 100 units of U 500 insulin in a volumetric syringe (0. 2 m. L) This shows the same dose (actual units) Humulin® R U 500 PI. 2016. http: //press. endocrine. org/doi/abs/10. 1210/MTP 5. 9781943550043. ch 18. 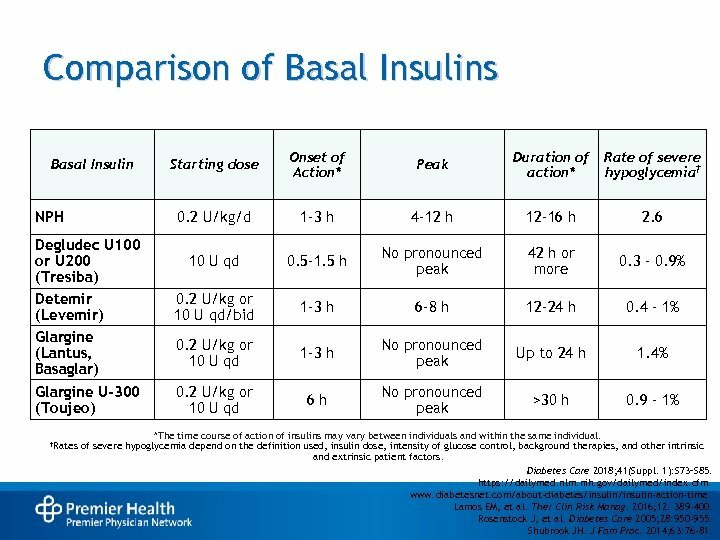 Comparison of Basal Insulins NPH Starting dose Onset of Action* Peak Duration of action* Rate of severe hypoglycemia† 0. 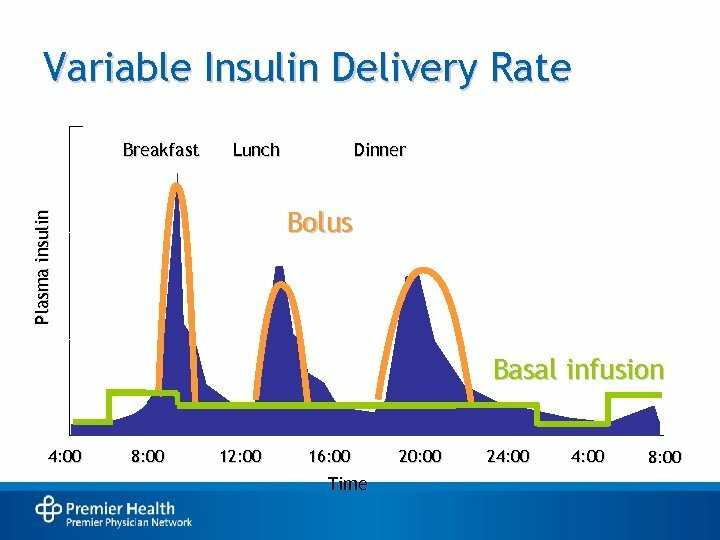 2 U/kg/d Basal Insulin 1 -3 h 4 -12 h 12 -16 h 2. 6 Degludec U 100 or U 200 (Tresiba) Detemir (Levemir) Glargine (Lantus, Basaglar) 10 U qd 0. 5 -1. 5 h No pronounced peak 42 h or more 0. 3 – 0. 9% 0. 2 U/kg or 10 U qd/bid 1 -3 h 6 -8 h 12 -24 h 0. 4 – 1% 0. 2 U/kg or 10 U qd 1 -3 h No pronounced peak Up to 24 h 1. 4% Glargine U-300 (Toujeo) 0. 2 U/kg or 10 U qd 6 h No pronounced peak >30 h 0. 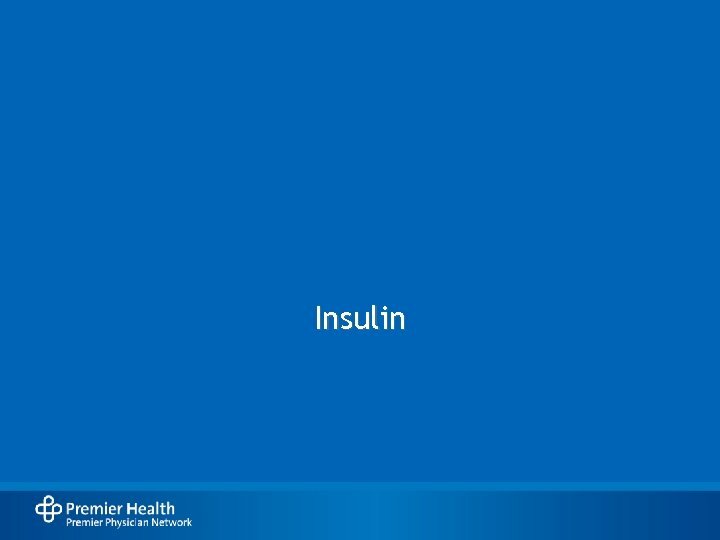 9 – 1% †Rates *The time course of action of insulins may vary between individuals and within the same individual. 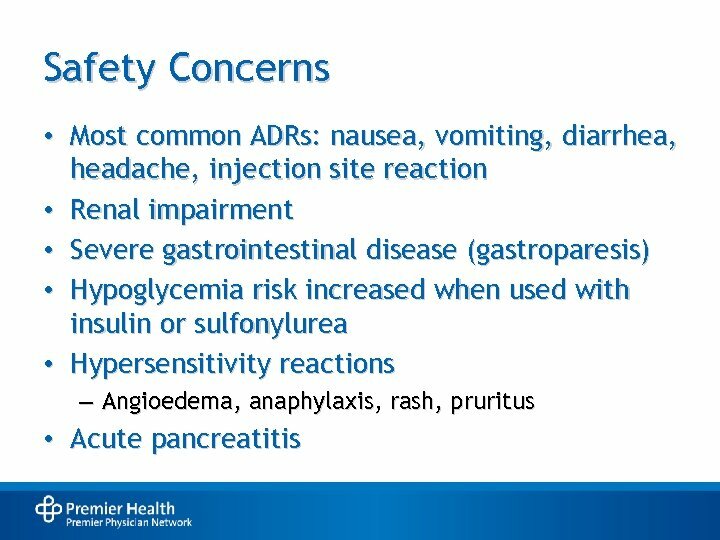 of severe hypoglycemia depend on the definition used, insulin dose, intensity of glucose control, background therapies, and other intrinsic and extrinsic patient factors. Diabetes Care 2018; 41(Suppl. 1): S 73–S 85. https: //dailymed. nlm. nih. gov/dailymed/index. cfm. www. 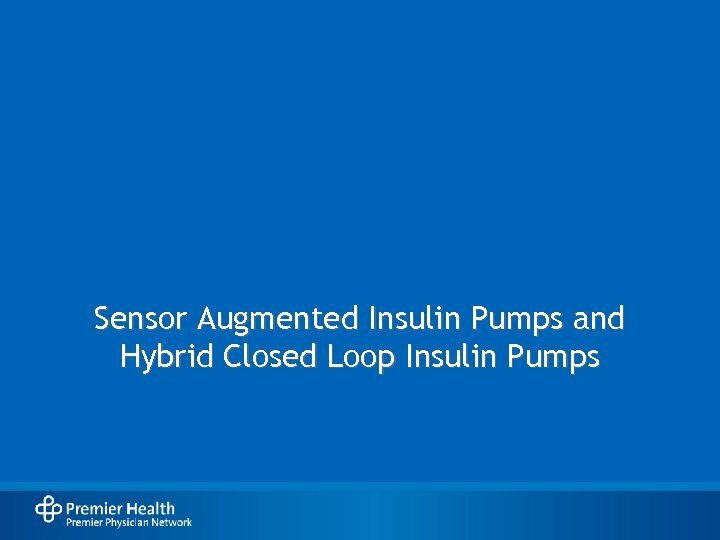 diabetesnet. 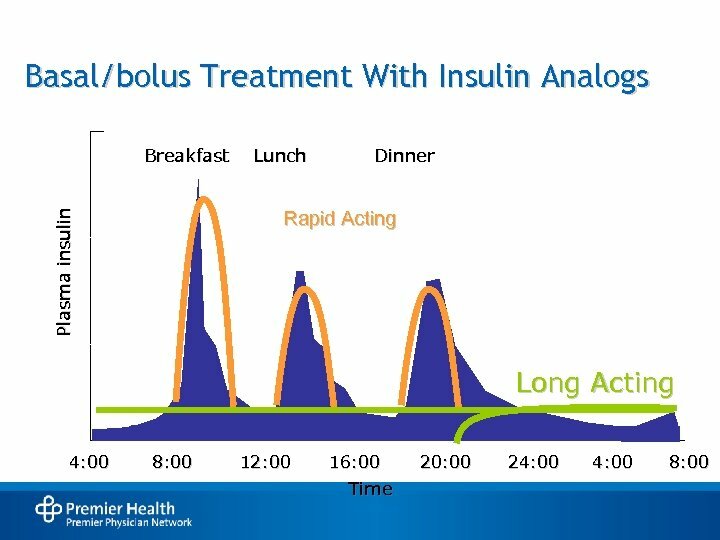 com/about-diabetes/insulin-action-time. Lamos EM, et al. Ther Clin Risk Manag. 2016; 12: 389 -400. Rosenstock J, et al. Diabetes Care 2005; 28: 950 -955. Shubrook JH. J Fam Prac. 2014; 63: 76 -81. 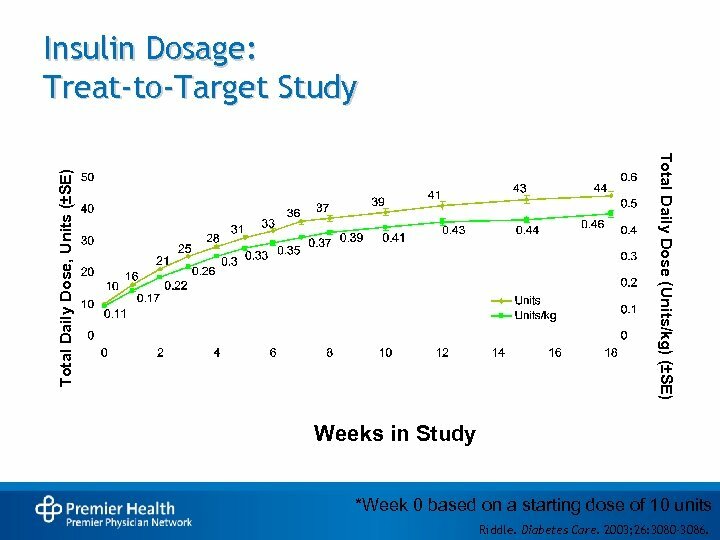 Insulin Dosage: Treat-to-Target Study Total Daily Dose, Units (±SE) Total Daily Dose (Units/kg) (±SE) Weeks in Study *Week 0 based on a starting dose of 10 units Riddle. Diabetes Care. 2003; 26: 3080 -3086. 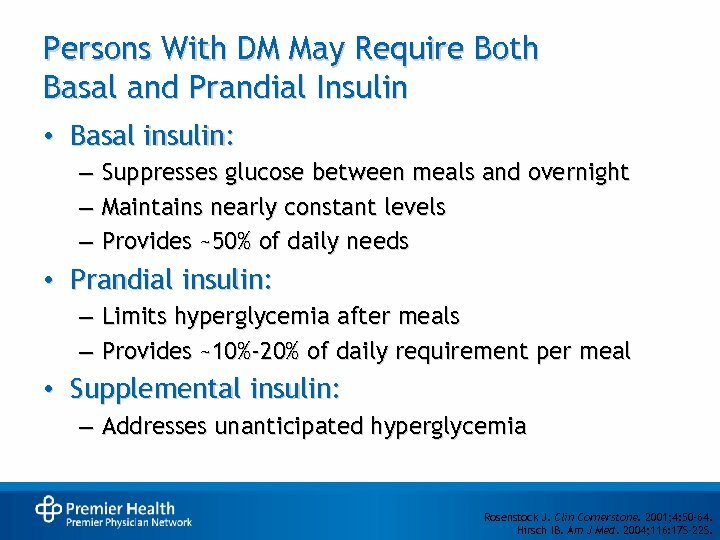 Persons With DM May Require Both Basal and Prandial Insulin • Basal insulin: – Suppresses glucose between meals and overnight – Maintains nearly constant levels – Provides ~50% of daily needs • Prandial insulin: – Limits hyperglycemia after meals – Provides ~10%-20% of daily requirement per meal • Supplemental insulin: – Addresses unanticipated hyperglycemia Rosenstock J. Clin Cornerstone. 2001; 4: 50 -64. Hirsch IB. Am J Med. 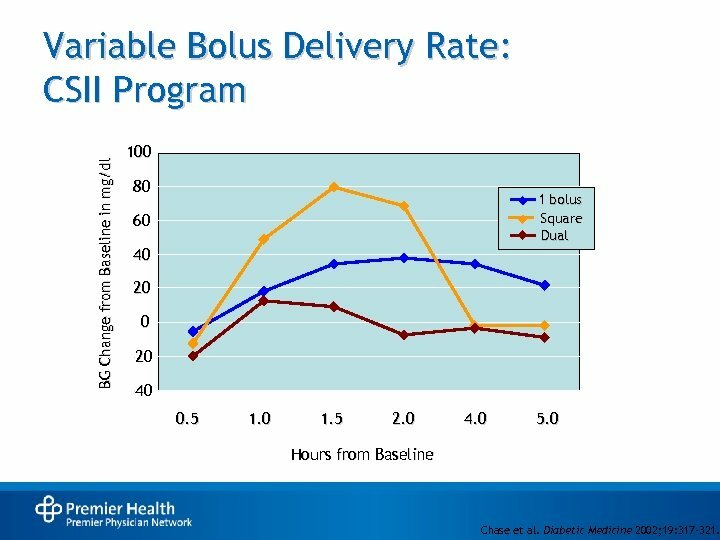 2004; 116: 17 S-22 S.
BG Change from Baseline in mg/dl Variable Bolus Delivery Rate: CSII Program 100 80 1 bolus Square Dual 60 40 20 0 -20 -40 0. 5 1. 0 1. 5 2. 0 4. 0 5. 0 Hours from Baseline Chase et al. Diabetic Medicine 2002; 19: 317 -321. 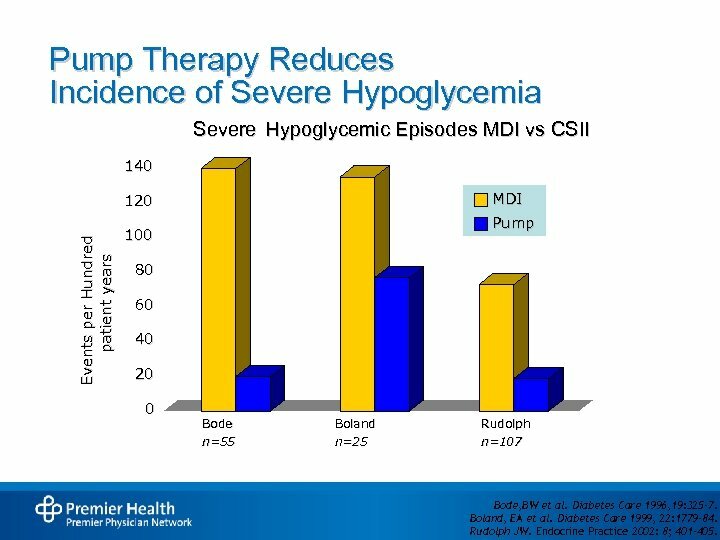 Pump Therapy Reduces Incidence of Severe Hypoglycemia Severe Hypoglycemic Episodes MDI vs CSII 140 MDI Events per Hundred patient years 120 Pump 100 80 60 40 20 0 Bode n=55 Boland n=25 Rudolph n=107 Bode, BW et al. Diabetes Care 1996, 19: 325 -7. Boland, EA et al. Diabetes Care 1999, 22: 1779 -84. Rudolph JW. Endocrine Practice 2002: 8; 401– 405. 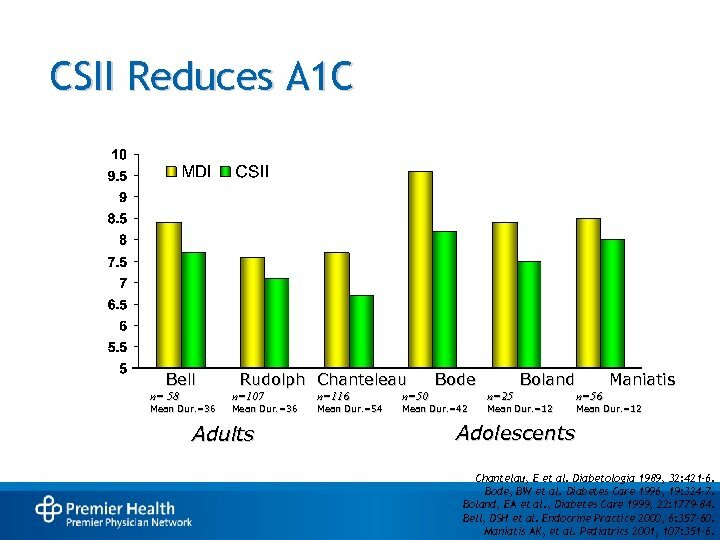 CSII Reduces A 1 C Bell n= 58 Mean Dur. =36 Rudolph Chanteleau n=107 Mean Dur. =36 Adults n=116 Mean Dur. =54 n=50 Bode Mean Dur. =42 Boland n=25 Mean Dur. =12 Maniatis n=56 Mean Dur. =12 Adolescents Chantelau, E et al. Diabetologia 1989, 32: 421 -6. Bode, BW et al. Diabetes Care 1996, 19: 324 -7. Boland, EA et al. , Diabetes Care 1999, 22: 1779 -84. Bell, DSH et al. Endocrine Practice 2000, 6: 357 -60. Maniatis AK, et al. Pediatrics 2001, 107: 351 -6. 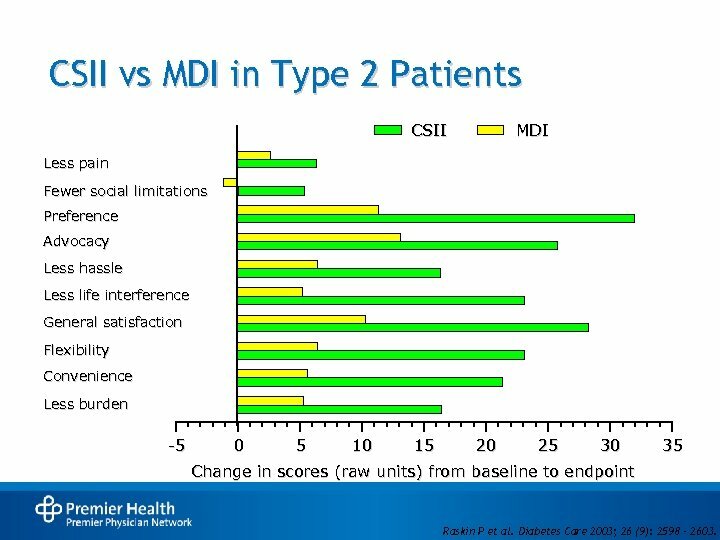 CSII vs MDI in Type 2 Patients CSII MDI Less pain Fewer social limitations Preference Advocacy Less hassle Less life interference General satisfaction Flexibility Convenience Less burden -5 0 5 10 15 20 25 30 35 Change in scores (raw units) from baseline to endpoint Raskin P et al. 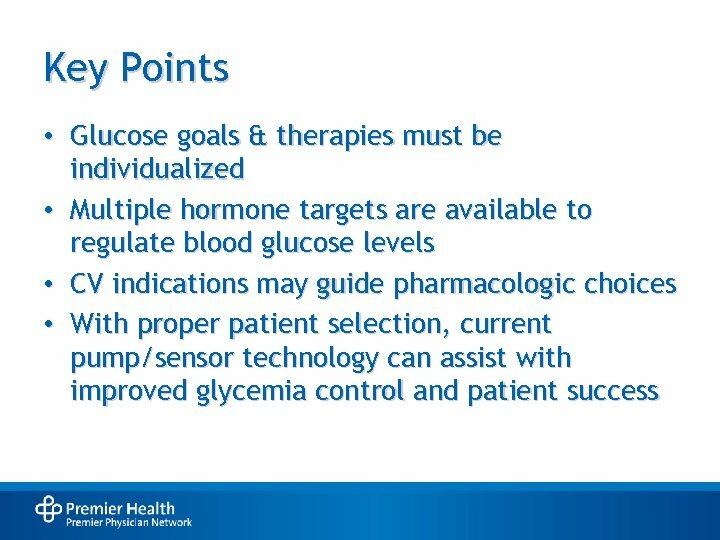 Diabetes Care 2003; 26 (9): 2598 – 2603. 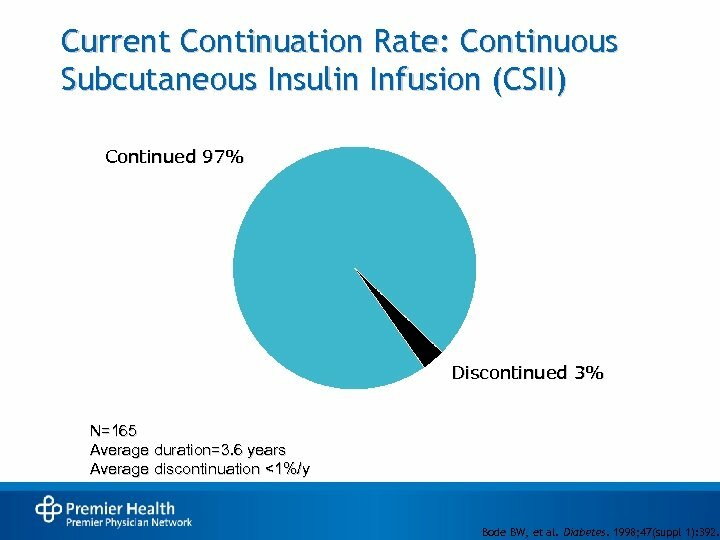 Current Continuation Rate: Continuous Subcutaneous Insulin Infusion (CSII) Continued 97% Discontinued 3% N=165 Average duration=3. 6 years Average discontinuation <1%/y Bode BW, et al. Diabetes. 1998; 47(suppl 1): 392. 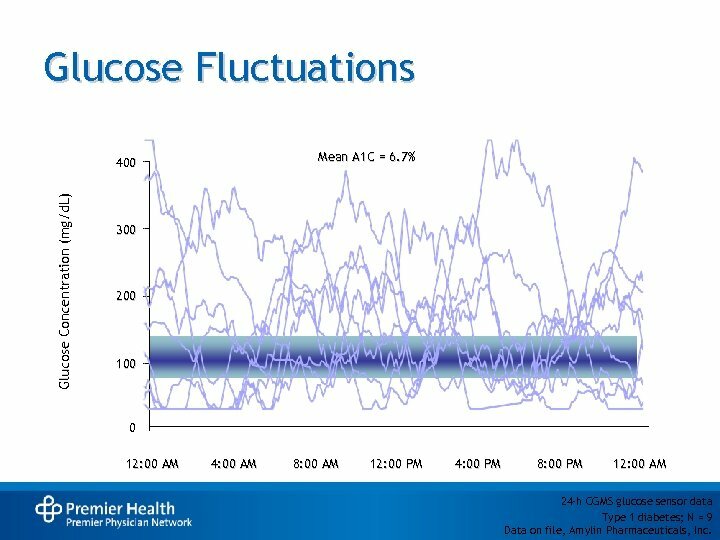 Glucose Fluctuations Mean A 1 C = 6. 7% Glucose Concentration (mg/d. 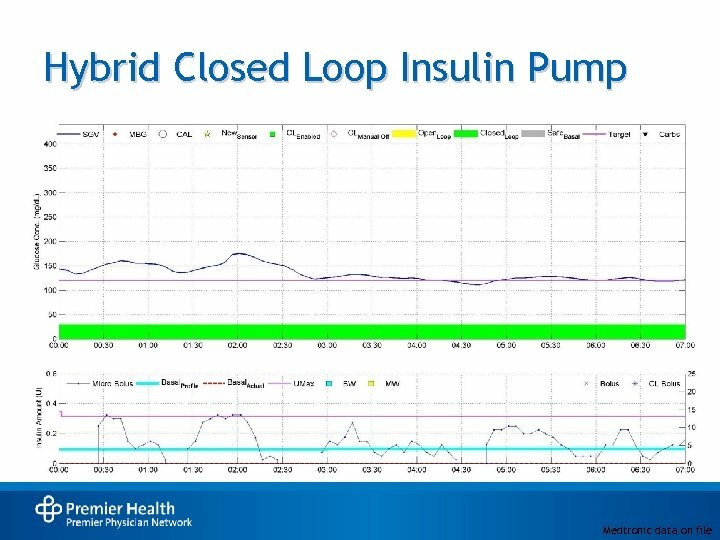 L) 400 300 200 100 0 12: 00 AM 4: 00 AM 8: 00 AM 12: 00 PM 4: 00 PM 8: 00 PM 12: 00 AM 24 -h CGMS glucose sensor data Type 1 diabetes; N = 9 Data on file, Amylin Pharmaceuticals, Inc.
Sensor-Augmented Insulin Pump • • • The ISIG (electron current) is sent to the transmitter Transmitter sends ISIG to the pump The pump converts ISIG to glucose value ISIG Diabetes Care 2018; 41 (Suppl. 1): S 55 -S 64. 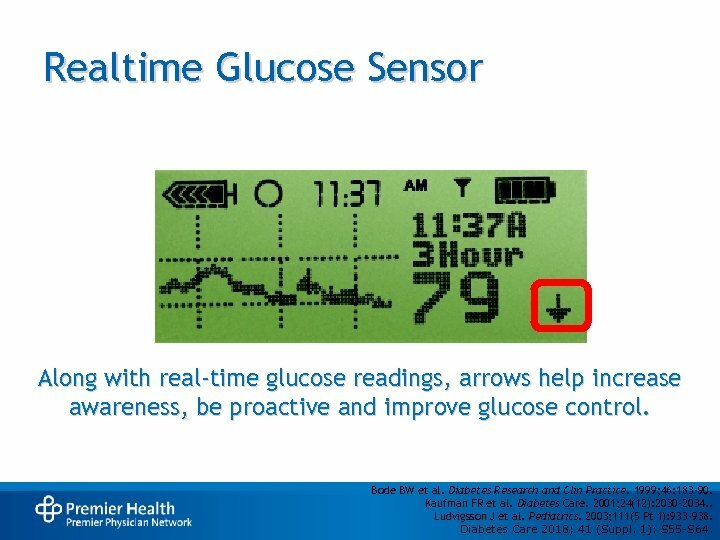 Realtime Glucose Sensor Along with real-time glucose readings, arrows help increase awareness, be proactive and improve glucose control. Bode BW et al. 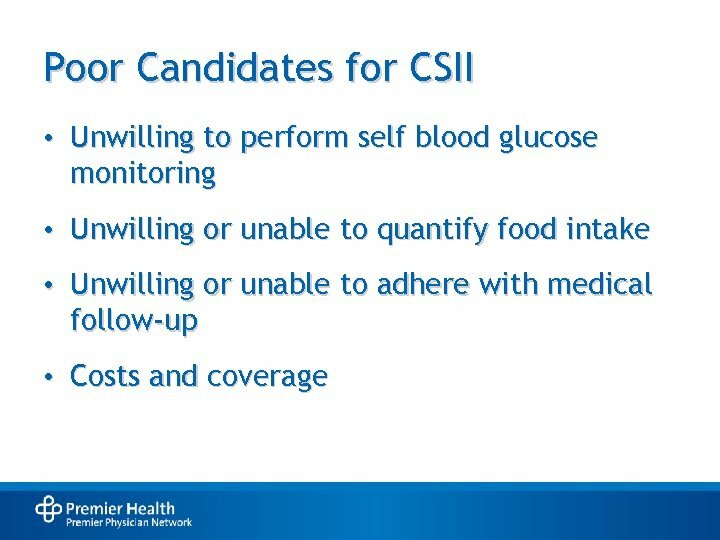 Diabetes Research and Clin Practice. 1999; 46: 183 -90. Kaufman FR et al. Diabetes Care. 2001; 24(12): 2030 -2034. . Ludvigsson J et al. Pediatrics. 2003; 111(5 Pt 1): 933 -938. 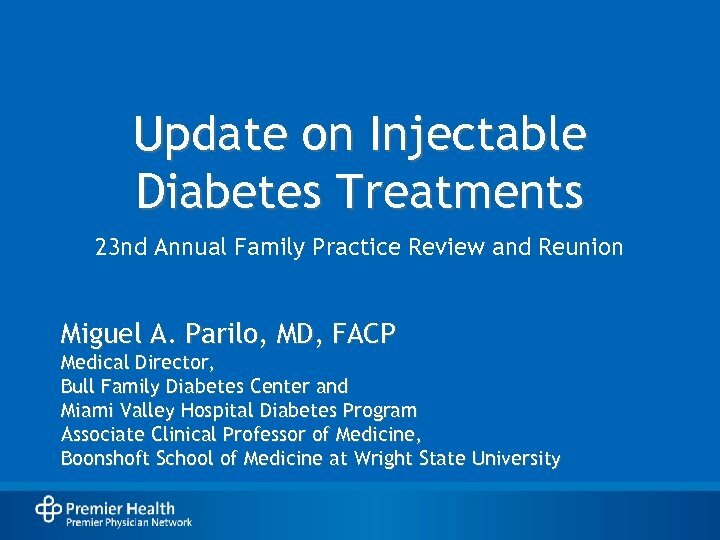 Diabetes Care 2018; 41 (Suppl. 1): S 55 -S 64. 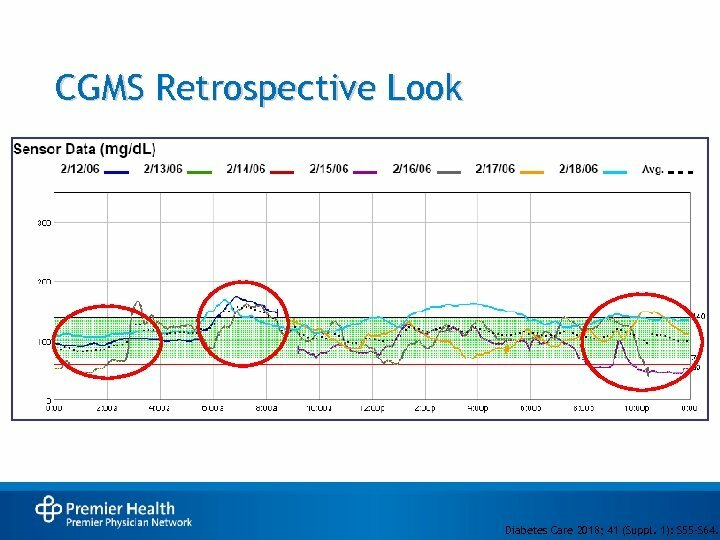 CGMS Retrospective Look Diabetes Care 2018; 41 (Suppl. 1): S 55 -S 64.